I learned to crochet from my grandmother as a child, but did not work on it much then. After my 20's, a group of my friends and I decided to take a class from our local school. 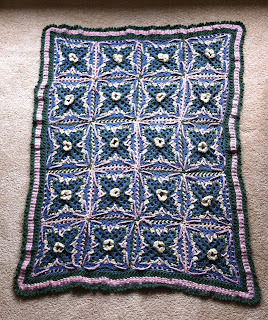 I found that I loved working with yarn, but feared color changes so I stuck to solids for years. Luckily, my fellow chapter members opened my eyes and now I can do all sorts of cool things that I never knew before. I’m a righty knife thrower! I am a Susan Bates lover with a wooden handle, but will try others. I have started using ERGO hooks to help with fatigue and pain. Acrylics are my fave – WW= 4. Vanna’s Choice all the way. The hdc is the best for what I like to do so it has less holes. Do you prefer a written pattern, a chart, or both? :I prefer a written pattern with everything spelled out and then I refer to the diagram for confirmation. I usually write out the repeats and started counting the stitches in total for that row so I do not miss a stitch. Too many mistakes has lead me here. warm the fall and winter. Tote bags and purse galore. 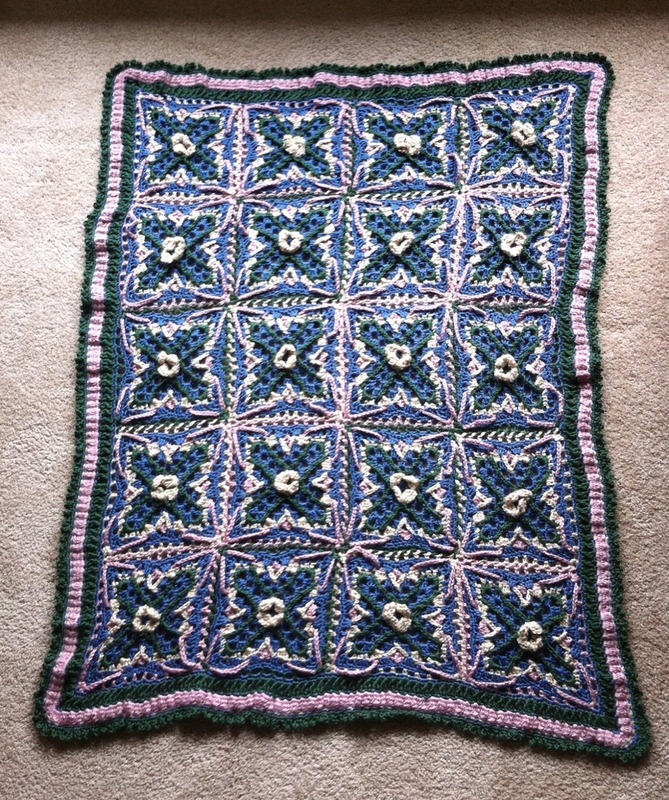 This Mystery Afghan was a blast to make with the Crochet Crowd! Our study group participated in this challenge. I have enjoyed networking at the annual conferences in which I have been to four. I love meeting my teachers and designers and enjoy everything they have to offer. I get to ask them in person to teach at our chapter workshops or our annual retreat weekend. Each conference is unique, but each year is even better since you get too caught up with friends you only get to see at conference. The design competition was spectacular this year especially since I volunteered my time to watch over the items for one shift. I was able to see the items close up and encourage people to vote for the favorite. That was a treat. I cannot wait to see everyone new and old in my home turf this summer at Chain Link. I look forward to seeing which classes will be offered and who will be honored at the events. Several years ago I joined my local chapter called Northern Illinois Chapter after I met a member at a local JoAnn’s store. She was there to promote the chapter while stitching at a table in the yarn department. She was so friendly and welcoming, I went to my first meeting the following month. Our group has over 40 active members that come to regular monthly meetings, but in total we have about 65. Each month we have a business meeting to discuss upcoming activities and event, plus we have a demo class that one of the members teaches. I have been honored to be the chapter President for the past year. We learn a great deal from each other. We also go around the room for show and tell to show off our current or finished projects and tell about things we read in blogs or on-line patterns we enjoyed using. When I found out all the cool things that this chapter does every month and every year, I was hooked (pun was intended!). 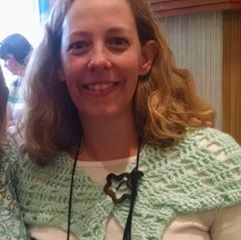 I have met wonderful women (and one man) in our group that have taught me so much that has increased my crochet knowledge and interest in new things. The chapter also has a weekly study group that one of our members organizes to assist those in need of help and work on small projects together. So much inspiration! Ask questions is my tip. The best way to learn something or find information is by asking those in your group. 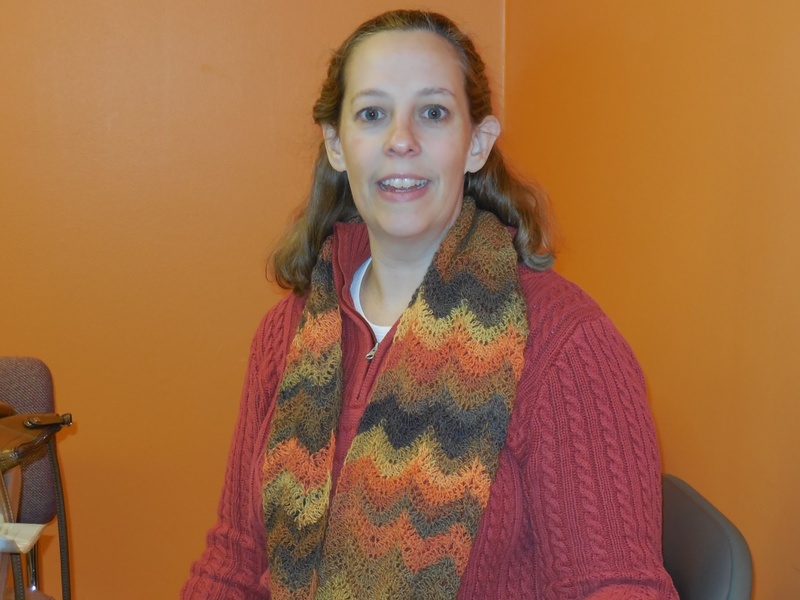 Thank you for sharing with us Pattie, it's been fun "getting to know you"! I'm Marie from Underground Crafter and I'm excited to share a new monthly series of posts with you for 2017! 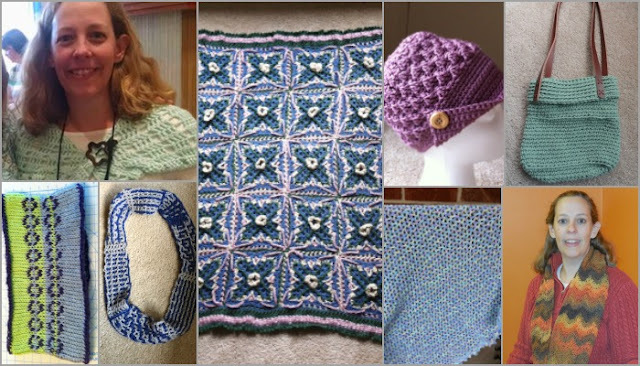 Each month, I'll be sharing a seasonal roundup of crochet patterns by some of the many talented designers who are members of the Crochet Guild of America. 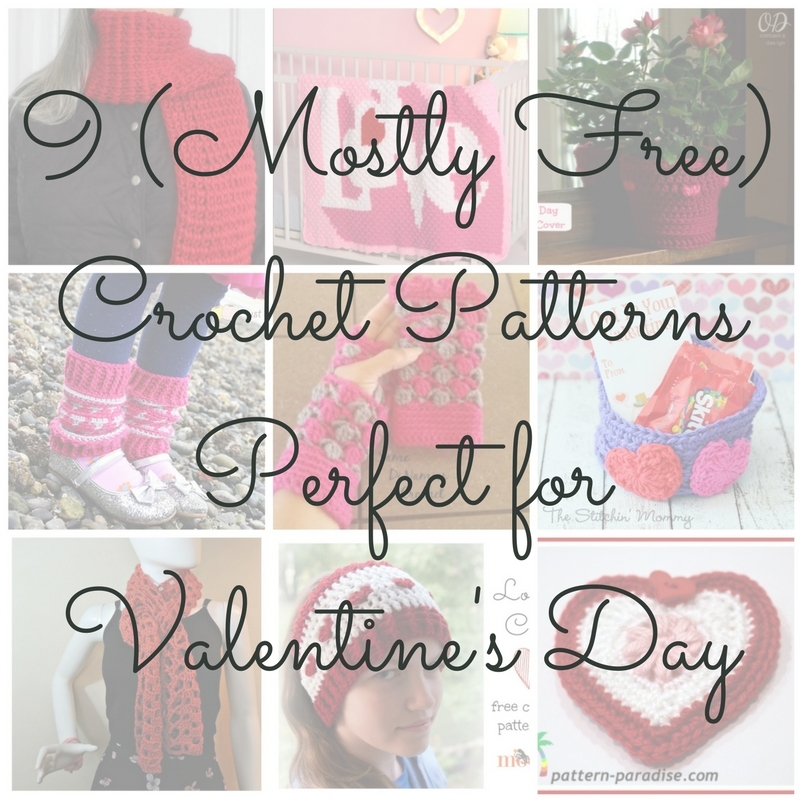 This month's roundup features 9 (mostly free) patterns that are perfect for Valentine's Day. All photos are used with permission of the respective designer or publisher. Enjoy! 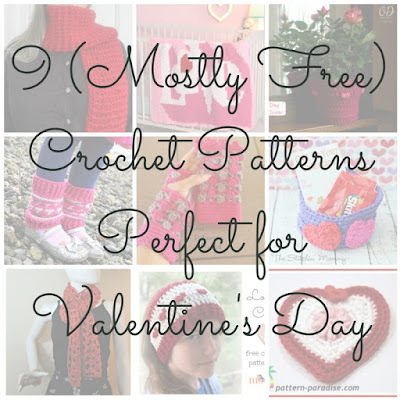 What are your favorite projects to make for Valentine's Day? I was provided with a copy of Baby Shoes to Crochet for an honest review. All opinions are those of Jessie Rayot of Jessie At Home. This review contains affiliate links. 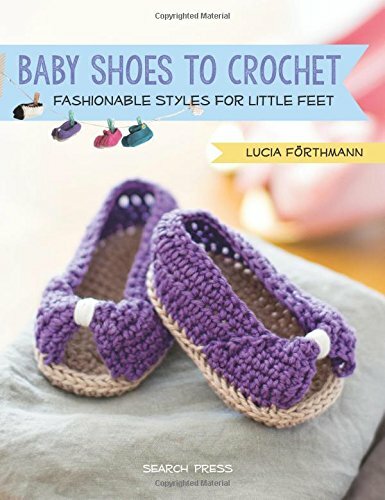 Baby Shoes to Crochet: Fashionable Styles for Little Feet by Lucia Forthmann is full of adorable baby shoes for everyday and special occasions! 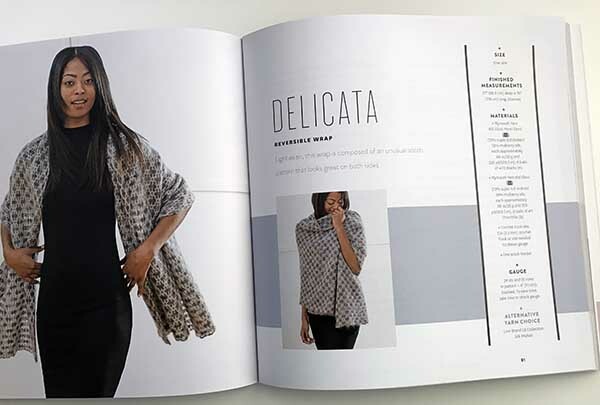 No matter your style or the occasion, you will find something for you in this book. The patterns are all in 3 sizes, 0-3 months, 3-6 months, and 6-9 months. The book starts with some sweet acknowledgements and an introduction. Right away, there are precious little line drawings that appear all over the book, making it that much cuter! Next is a very comprehensive section on crochet basics with written and photo instructions on everything from a chain, to basic stitches, increases, decreases, some of the special stitches in the book, and more! Next is a list of abbreviations so you can properly use the book, and instructions for soles. I LOVE that most of the patterns in the book use the same sole pattern. They're shoes, why not use the same sole pattern? It just makes using the book so much easier! There are even stitch diagrams for the sole. Next, of course, are the patterns for the shoes. Many of them are pictured with the adult versions of the shoe that inspired them. You will find everything from flats to sneakers, cowboy boots to work boots, ballet slippers to hippy boots, and more! 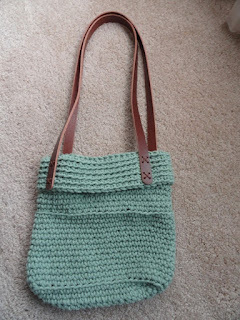 The patterns are simple enough for a strong beginner, but interesting enough to keep an advanced crocheter going. The instructions appear clear and easy to read. There are photos with each shoe, so you know what you are trying to accomplish. 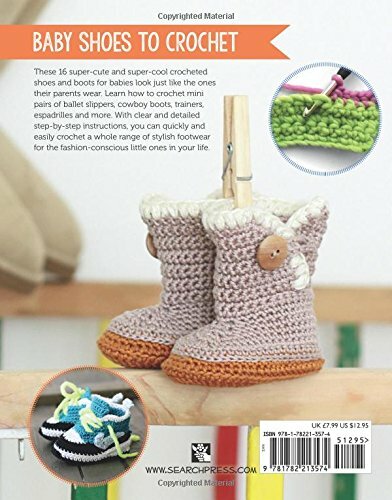 Over all, this is a great book for someone looking to crochet some baby shoes. 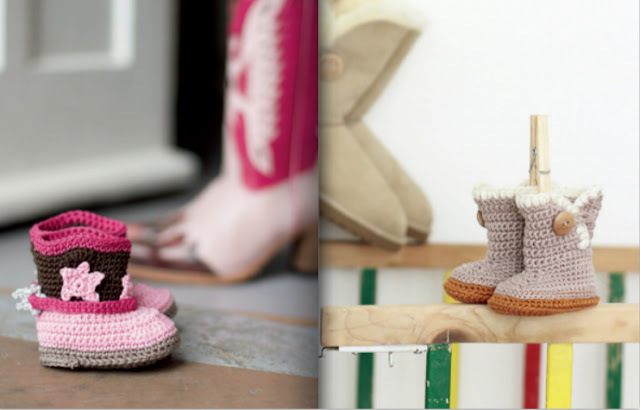 Baby Shoes to Crochet can be purchased from Search Press (HERE) or from Amazon (HERE). 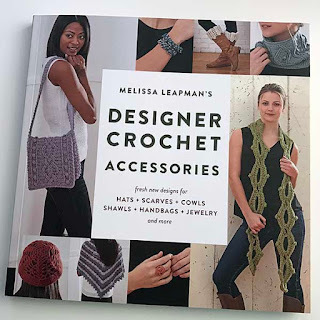 This book will make a great addition to your crochet library! Would you like a copy of your own? Enter the giveaway below for a chance to win one! 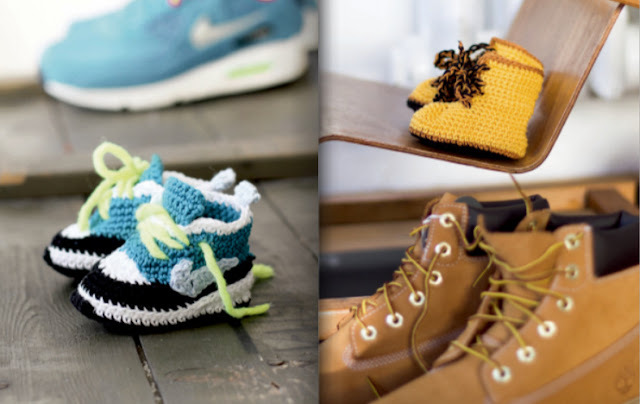 The Baby Shoes to Crochet giveaway is open to people with a valid USA shipping address who are 18 years old or older. The giveaway will end on 1/22/17 at the end of day Eastern time. A winner will be randomly chosen and notified by email. Winner will have one week to respond to the email with a valid USA shipping address, or a new winner will be chosen. The right accessory can turn an OK outfit into a show-stopper, and they make great gifts too! In this book, Melissa Leapman shares with us 25 stunning accessory designs. From traditional to trendy, subtle to dramatic, rings to wraps, you're sure to find a new favorite here! Speaking of favorites - while all the patterns are very lovely, there's one that completely takes my breath away. 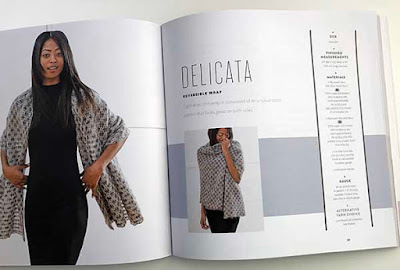 The Delicata Reversible Wrap is hands down my favorite of the whole book. It's light and delicate, but still looks warm and fuzzy thanks to the mohair yarn. The reversible stitch pattern is intriguing, and seems surprisingly easy (at least from reading through it). 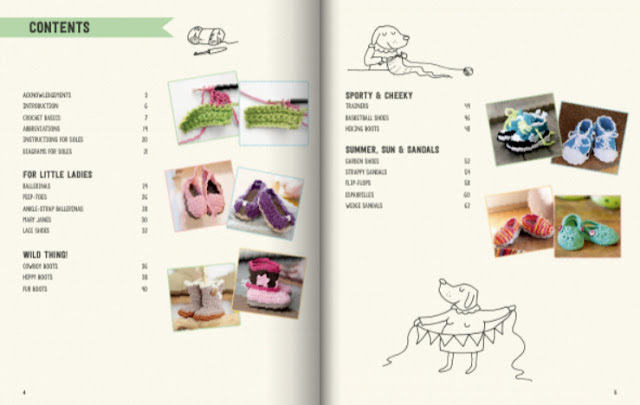 In the front of the book is a beautiful spread showing all the patterns. I did wish they were numbered or labeled in some way, or at least displayed in the same order as the table of contents. For the most part though, it was pretty easy to tell which picture goes with which name. As usual with Melissa's patterns, the instructions for all the projects are very clearly written and easy to understand. They also include stitch diagrams, and some include schematics or other helpful illustrations as well. 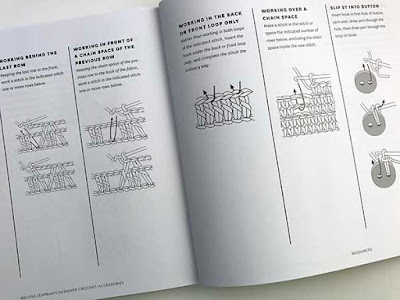 In the back of the book is a helpful resource section, which includes instructions for the basic stitches, help in reading the charts, and tips on finishing. You can enter to win your own copy of Designer Crochet Accessories! This prize is generously provided by the publisher, Creative Publishing International. To be eligible, you must be 18 years of age or older, with a valid, US or Canadian shipping address. The winner will be contacted by email, and must reply to that email and provide the shipping address within 1 week in order to receive the prize. If the winner does not reply within 1 week, a new winner will be selected. The giveaway ends on January 30th - Hurry and enter below! 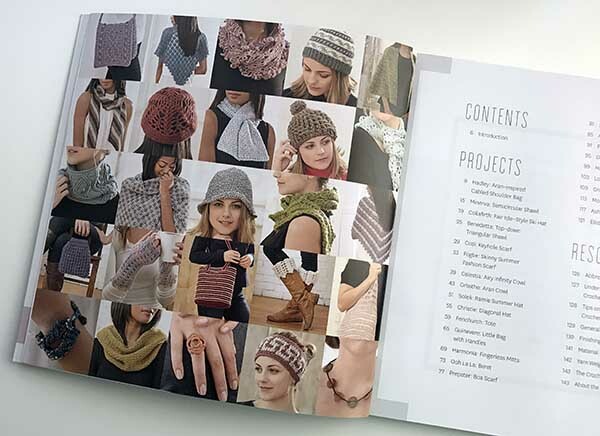 Disclaimer: A free review copy of Designer Crochet Accessories was provided by Creative Publishing International. Although I accept free products for review, I do not accept additional compensation, nor do I guarantee a positive review. My reviews are based entirely on my honest opinions. All images of copyrighted material are used with permission. 2017 Chapter Challenge is Here! CGOA is bringing back the chapter challenge. The challenge is open to all Chapters and will run from Jan 1, 2017 to June 30, 2017. We are working with Warm Up America on this challenge. 1. Create as many 7" x 9" rectangles as you choose for Lapghans for Warm Up America! (This is their size requirement.) Contest ends June 30th. 2. Visit the "Warm Up America" website at www.WarmUpAmerica.org for details on preferred lapghan sizes and free crochet patterns your chapter can use. 3. When your Chapter is finished, please count and double count all your rectangles and then make a sign. Include the Chapter name (as per CGOA website) and the total number of rectangles made. Next take a picture of the sign - hopefully with some Chapter Members holding it - and email to Karen McKenna CGOAChapters@gmail.com by July 1st. 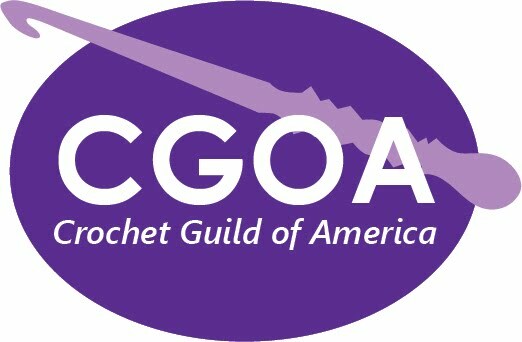 Please include the number of CGOA members in your Chapter as winners are based on a ratio of members to number of rectangles made, this way smaller chapters can compete with larger chapters. Please Note: Do not send any finished rectangles to Karen. You can put the squares together as lapghans for donation, or donate the squares to your favorite local charity. 4. Winners will be announced on Saturday, July 28th in the Market Place at the Chain Link Conference in Chicago! AND WE HAVE A SURPRISE…. RED HEART IS SPONSORING CASH PRIZES!! Golden Hook Plaque & $75.00 Cash! Silver Hook Plaque & $50.00 Cash! Bronze Hook Plaque & $25.00 Cash!